The success of the monthly magazine Zion's Freund, published by our Jewish mission in Hamburg, was largely due to the fact that on the first page there always appeared the picture of some Jew, together with, the story of his conversion. We also published a booklet entitled Israel's Witnesses, which contained twelve such biographies. The names and addresses of all the professional people in Germany were sold by a certain firm, and this enabled us to send this booklet to many Jews. To counteract the influence of these biographies, the Jews in Hamburg published a similar pamphlet, without photographs, giving the stories of twelve Christians who had accepted the Jewish faith. "Israel's Witnesses" were a means of great blessing to many Jews. A rabbi, Dr. Müller, who had read our booklet, came to see me from central Germany. He shared the common belief that every Jew who accepted Christianity did it in the hope of worldly gain. He was therefore greatly surprised to read of Jewish converts, highly educated men in prominent positions, among them professors and lawyers, who knew quite well that if they accepted Christ as their Messiah and were baptized they would be disowned by their relatives and lose financially. He was amazed when in the same booklet he read of rabbis, two alive at that time, who because of their faith in Christ had to leave their congregations. He read and reread the stories of those converts, and wondered at their courage and their zeal for Christ. He decided to study the New Testament. With trembling heart he opened it, for he was prejudiced against Christianity, and was afraid of what the consequences might be if he too became convinced that Jesus was the Messiah. As he turned over the pages of the New Testament, he was astonished to see the well known names of Bethlehem and Jerusalem, as well as many quotations from the Old Testament. That encouraged him to read on, and his interest rapidly increased. Anew world of thought and life was opened to him. Jews believed that women had no soul and therefore needed no religious conversation even with a Samaritan woman. Lepers were shunned in Palestine, but Jesus, showing His sympathy, touched and healed them. He proved by word and deed that God is no respecter of persons, but loves alike Jews, Samaritans and Gentiles. All this was in contrast to the spirit of those days. 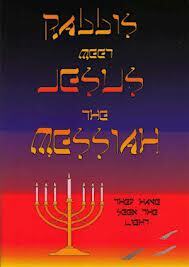 The rabbi saw in Jesus the only perfect example, and the true Messiah. The messianic prophecies were fulfilled; the offerings of animals at the great Jewish festivals had lost their meaning after Christ had made the supreme sacrifice. When he came to that conviction the following words of the apostle Paul had a wonderful effect on him: "God was in Christ reconciling the world unto Himself, not imputing their transgressions unto them." The meaning of Isaiah 53 became clear, and his heart rejoiced in Christ his Saviour. Before the rabbi left me, we prayed together, praising God for His redeeming love in His Son Jesus Christ. After some weeks my colleague, the Rev. Dr. Moser, took the long journey to visit the rabbi in his home. In that town Dr. Moser met Jews who belonged to Dr: Müller's congregation. They told him that the orthodox members were displeased with the rabbi for so often referring to "the book of the Christians," meaning the New Testament. Not long after, the second world war broke out, and he has never been heard of since. It is more than likely that he and his congregation lost their lives with millions of other Jews at the hands of the Nazis.